Following is a list of all the Early Life History Conferences since 1977. It indicates the dates, places, host institution, resulting publications, and other information for each conference. Although the Early Life History Section did not become an official Section of the American Fisheries Society until 1980, Larval Fish Conferences began in 1977 on an ad hoc basis. So the Annual Larval Fish Conferences of the Early Life History Section are a continuation of the formerly independent but strong larval fish oriented Larval Fish Conferences. 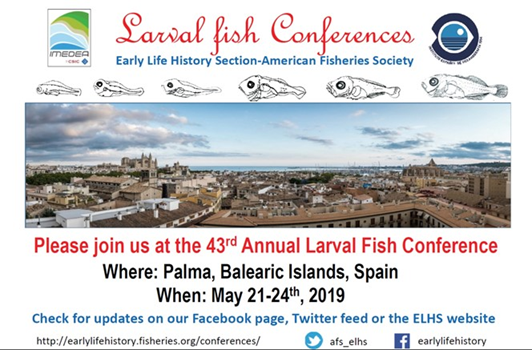 The Larval Fish Conference is held at a time and place determined by the Executive Committee of the Early Life History Section in consultation with the Time and Place Committee and the general membership. The Annual Business Meeting of the Early Life History Section is held at the site of the Larval Fish Conference. 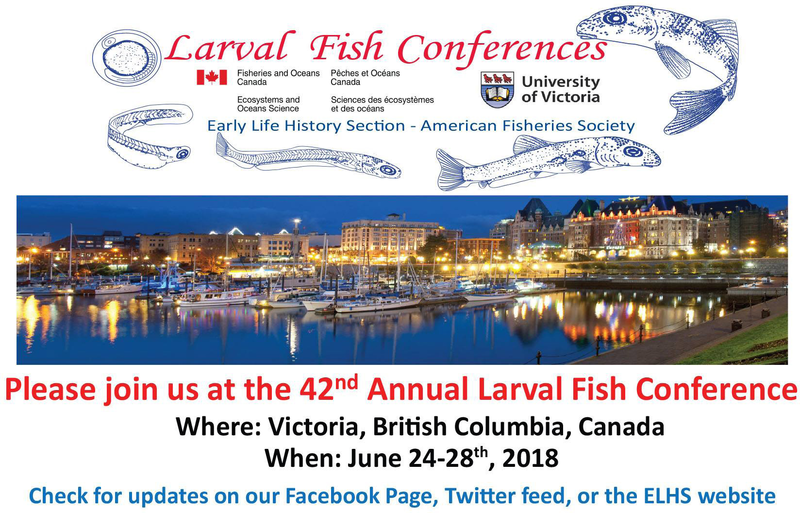 The annual Larval Fish Conference is organized and run by the volunteer Local Organizing Committee of the Host Institution and other sponsoring organizations on behalf of the Early Life History Section. The Local Organizing Committee is chaired by an Early Life History Section member and guided by the ELHS Annual Conference Committee. First Symposium on Freshwater Larval Fish. Duke Power Company, Charlotte, North Carolina. 24-25 February, 1977. (Chaired by Larry L. Olmstead) (Subsequently, considered as the 1st Larval Fish Conference of the Early Life History Section, American Fisheries Society). Publication: Olmstead, Larry L., Ed. 1978. Proceedings of the First Symposium on Freshwater Larval Fish. Duke Power Company, Cornelius, North Carolina. Available: Duke Power Company (Duke Electric Corp.), Washington, North Carolina 27889-9606. Out of print. A pdf of the proceedings is available here. Second Symposium on Freshwater Larval Fish. Tennessee Valley Authority, Knoxville, Tennessee. 21-22 February 1978. (Chaired by Robert Wallus). (Subsequently, considered as the 2nd Larval Fish Conference of the Early Life History Section, American Fisheries Society). Publication: Wallus, R., and C.W. Voigtlander, Eds. 1979. Proceedings of a Workshop on Freshwater Larval Fishes. 239 pp. Tennessee Valley Authority, Division of Forestry, Fisheries and Wildlife Development, Norris, Tennessee. Available: Tennessee Valley Authority, Water Resources Library, Haney Building 2S 270C, Chattanooga, Tennessee 37402-2801. Out of print. Third Symposium on Larval Fish. Western Kentucky University, Bowling Green, Kentucky. 20-21 February 1979 (Chaired by Robert D. Hoyt). (Subsequently, considered as the 3rd Larval Fish Conference of the Early Life History Section, American Fisheries Society). Publication: Hoyt, R.D., Ed. 1979, Proceedings of the Third Symposium on Larval Fish. 236 pp. Western Kentucky University, Bowling Green, Kentucky 42101. Available: R.D. Hoyt, Western Kentucky University, Bowling Green, Kentucky. Out of print. Fourth Annual Larval Fish Conference. University of Mississippi, Oxford, Mississippi, 27-28 February 1980 (Chaired by Ronald A. Fritzsche). (Subsequently, considered as the 4th Larval Fish Conference of the Early Life History Section, American Fisheries Society). Publication: Fuiman, L.A., Ed. 1980. Proceedings of the Fourth Annual Larval Fish Conference. U.S. Fish and Wildlife Service, FWS/OBS-80/43. 179 pp. Available: National Technical Information Service, U. S. Department of Commerce, 5285 Port Royal Road, Springfield, Virginia 22161. NTIS # PB81-115966. Call: 1-(800)-553-6847, fax: (703) 605-6900, visit the National Technical Information Service website, or contact NTIS Orders. Hardcopy, $51 + $5 handling fee inside the U.S., Canada, and Mexico; microfiche, $15 + $5 handling fee inside the U.S., Canada, and Mexico; microfiche, $30 + $10 handling fee for customers outside the U.S., Canada, and Mexico. 5th Annual Larval Fish Conference. Louisiana State University, Baton Rouge, Louisiana, 2-3 March 1981 (Chaired by John V. Conner). Publication: Bryan, C. F., J. V. Conner, and F. M. Truesdale, Eds. 1982. Fifth Annual Larval Fish Conference. 86 pp. Louisiana Cooperative Fishery Research Unit and The School of Forestry and Wildlife Management, Louisiana State University, Baton Rouge, Louisiana. Available: Louisiana Cooperative Fishery Research Unit, 245 Ag. Center, Louisiana State University, Baton Rouge, Louisiana 70803; $8 for mailing in USA, $10 for mailing to other countries. 6th Annual Larval Fish Conference. Chesapeake Biological Laboratory, University of Maryland, Solomons, Maryland, 1-3 March, 1982 (Chaired by F. Douglas Martin). Publication: Martin, F.D. Ed. 1983. “The Sixth Larval Fish Conference”. In: Transactions of the American Fisheries Society 112(2B):233-353. Available: American Fisheries Society, 5410 Grosvenor Lane, Suite 110, Bethesda, Maryland 20814-2199. Visit the AFS bookstore page. Hardcopy, $8 for AFS members, $15 for nonmembers, postage paid in the USA. Add $2.50 extra for shipment outside the USA. Prepayment required for individuals. 7th Annual Larval Fish Conference. Colorado State University, Fort Collins, Colorado, 16-19 January, 1983. (Chaired by Darrel E. Snyder). Publication: Snyder, D.E. Ed. 1984. “The Seventh Larval Fish Conference”. In: Transactions of the American Fisheries Society 113(2):151-259. Available: American Fisheries Society, 5410 Grosvenor Lane, Suite 110, Bethesda, Maryland 20814-2199. Visit the AFS bookstore page. Hardcopy, $8 for AFS members, $15 for nonmembers, postage paid in the USA. Add $2.50 extra for shipment outside the USA. Prepayment required for individuals. 8th Annual Larval Fish Conference and 3rd International Symposium on the Early Life History of Fishes. University of British Columbia, Vancouver, British Columbia, 6-10 May, 1984. (Chaired by Jeffrey B. Marliave). Publication 1: Marliave, J. B. Ed. 1985. “International Symposium on the Early Life History of Fishes and Eighth Annual Larval Fish Conference”. In: Transactions of the American Fisheries Society 114(4):443-621. Available: American Fisheries Society, 5410 Grosvenor Lane, Suite 110, Bethesda, Maryland 20814-2199. Visit the AFS bookstore page. Hardcopy, $8 for AFS members, $15 for nonmembers, postage paid in the USA. Add $2.50 extra for shipment outside the USA. Prepayment required for individuals. Publication 2: Kendall, Jr., A.W., and J.B. Marliave, Eds. 1985. Descriptions of Early Life History Stages of Selected Fishes: from the 3rd International Symposium on the Early Life History of Fishes & 8th Annual Larval Fish Conference. Canadian Technical Report of Fisheries and Aquatic Sciences. No.1359, 82 pp. Dept. of Fisheries and Oceans, Fisheries Research Board, Pacific Biological Station, Nanaimo, British Columbia V9R 5K6. Out of print. 9th Annual Larval Fish Conference. University of Texas Marine Science Institute, Port Aransas, Texas, 24-28 February, 1985. (Chaired by G. Joan Holt). Publication: Hubbs, C. Ed. 1986.””9th Annual Larval Fish Conference”. In: Transactions of the American Fisheries Society 115(1):98-171. Available: American Fisheries Society, 5410 Grosvenor Lane, Suite 110, Bethesda, Maryland 20814-2199. Visit the AFS bookstore page. Hardcopy, $8 for AFS members, $15 for nonmembers, postage paid in the USA. Add $2.50 extra for shipment outside the USA. Prepayment required for individuals. 10th Annual Larval Fish Conference. University of Miami, Miami, Florida, 18-23 May, 1986. (Chaired by William Richards). Publication: Hoyt, R.D., Ed. 1987. 10th Annual Larval Fish Conference. Symposium 2. American Fisheries Society, 190 pp. ISBN 0-913235-45-8. Available: American Fisheries Society, Fulfillment Dept. P.O. Box 1056, Evans City, Pennsylvannia 16033. Stock # 540.02P, $18 for AFS members, $22 for nonmembers, plus $4.50 if shipped within the USA, $6.50 if shipped outside USA. Visit Ordering Information. 11th Annual Larval Fish Conference. Michigan Technological University, Houghton, Michigan, 1-3 June, 1987. (Chaired by Nancy A. Auer). Publication: Hoyt, R.D., Ed. 1988, 11th Annual Larval Fish Conference. Symposium 5, American Fisheries Society, 130 pp. ISBN 0-913235-57-1. Available: American Fisheries Society, Fulfillment Dept. P.O. Box 1056, Evans City, Pennsylvannia 16033. Stock # 540.05, $15 for AFS members, $19 for nonmembers, plus $4.50 if shipped within the USA, $6.50 if shipped outside USA. Visit Ordering Information. 12th Annual Larval Fish Conference. University of Michigan, Ann Arbor, Michigan, 24-29 June, 1988. (Chaired by Neal R. Foster). [Joint meeting with the American Society of Ichthyologists & Herpetologists, Society for the Study of Amphibians & Reptiles, The Herpetologists League, and The American Elasmobranch Society]. Publication: Hoyt, R.D. 1989. “12th Annual Larval Fish Conference”. In: Transactions of the American Fisheries Society 118(2):00-000. Available: American Fisheries Society, 5410 Grosvenor Lane, Suite 110, Bethesda, Maryland 20814-2199. Hardcopy, $8 for AFS members, $15 for nonmembers, postage paid in the USA. Add $2.50 extra for shipment outside the USA. Prepayment required for individuals. 13th Annual Larval Fish Conference. Merida, Yucatan, Mexico, 21-26 May, 1989. Hosted by Mote Marine Laboratory, Sarasota, Florida, and Instituto Nacional de Pesca, Mexico City, Mexico. (Chaired by Karen Burns). Publication: Hoyt, R.D., Ed. 1991. Larval Fish Recruitment and Research in the Americas. Proceedings of the 13th Annual Larval Fish Conference. NOAA Technical Report MNSS95. Available: U.S. Dept. of Commerce, National Technical Information Service, 5285 Port Royal Road, Springfield, Virginia 22161. Call: 1-800-553-6847, fax: (703) 605-6900, visit the National Technical Information Service website, or contact NTIS Orders. Hardcopy, $41+ $5 handling fee inside the U.S., Canada, and Mexico; $83 + $10 handling fee outside the U.S., Canada, and Mexico; microfiche, $15 + $5 handling fee inside the U.S., Canada, and Mexico; microfiche, $30 + $10 handling fee for customers outside the U.S., Canada, and Mexico. Prices always subject to change. 14th Annual Larval Fish Conference. The NOAA Beaufort Laboratory, Beaufort, North Carolina, 6-9 May, 1990. (Chaired by Stanley M. Warlen). 15th Annual Larval Fish Conference. Los Angeles County Museum of Natural History, Los Angeles, California. 23-27 June, 1991. (Chaired by Robert Lavenberg). Publication 1: Moser, H.G., P.E. Smith, and L.A. Fuiman, eds. 1993. “Advances in the early life history of fishes. Part 1. Larval fish assemblages and ocean boundaries”. Bulletin of Marine Science 53:283-722. Available: Bulletin of Marine Science, 4600 Rickenbacker Causeway, Miami, Florida 33149. Non-subscribers: $35 post-paid surface; $55 post-paid air mail; Subscribers: $20 post-paid surface; $40 post-paid air mail. For more information on ordering back issues see the Bulletin of Marine Science website. Publication 2: Hunter, J.R., N.C.-H. Lo, and L.A. Fuiman, eds. 1993. “Advances in the early life history of fishes. Part 2. Ichthyoplankton methods for estimating fish biomass”. Bulletin of Marine Science 53:723-935. Available: Bulletin of Marine Science, 4600 Rickenbacker Causeway, Miami, Florida 33149. Non-subscribers: $35 post-paid surface; $55 post-paid air mail; Subscribers: $20 post-paid surface; $40 post-paid air mail. For more information on ordering back issues see the Bulletin of Marine Science website. 16th Annual Larval Fish Conference. Department of Zoology, University of Rhode Island, Kingston, Rhode Island, 16-20 June 1992. (Chaired by David Bengtson). Publication: Fuiman, L.A. Ed. 1993. “Water Quality and the Early Life Stages of Fishes”. Symposium 14, American Fisheries Society, 172 pp., ISBN 0-913235-86-5. Available: American Fisheries Society, Fulfillment Dept. P.O. Box 1056, Evans City, Pennsylvannia 16033. Stock #540.14P, $33 AFS members and non-members, plus $4.50 if shipped within the USA, $6.50 if shipped outside USA. Visit Ordering Information. 17th Annual Larval Fish Conference. University of Texas, Austin, Texas. 22-29 May, 1993. (Chaired by Lee A. Fuiman and Scott A. Holt). [Joint meeting with the American Society of Ichthyologists & Herpetologists]. 18th Annual Larval Fish Conference. Huntsman Marine Science Centre, St. Andrews, New Brunswick, 26-28 June, 1994. (Chaired by Matt Litvak). Publication: Chambers, R.C. and E.A. Trippel, Eds. 1997. Early Life History and Recruitment in Fish Populations, 632pp. ISBN 0-412-64190-9. Available: Kluwer Academic Publishers, PO. Box 358, Accord Station, Hingham, MA 02018-0358. Hardcopy, $132.50 + shipping and handling. 19th Annual Larval Fish Conference and International Larval Fish Conference. University of Sydney, Sydney, Australia. 26-30 June, 1995. (Chaired by Michael Kingsford and Jeffrey Leis). [Joint meeting with Australian Society for Fish Biology]. Publication 1: Grant, A., Ed. 1996. “Papers from the International Larval Fish Conference, Sydney, 1995, held under the auspices of the Early Life History Section of the American Fisheries Society and the Australian Society for Fish Biology”. Marine and Freshwater Research 47:97-482. Available: CSIRO Publishing, P.O. Box 1139, Collingwood Victoria 3066, Australia. Hardcopy, $65 plus $6 shipping and handling. See Journal of Marine and Freshwater Research website. Publication 2: Leis, Jeffrey M., John E. Olney, and Muneo Okiyama, Guest Eds. 1997. “Proceedings of the Symposium, Fish Larvae and Systematics: Ontogeny and Relationships, from the International Larval Fish Conference”. Bulletin of Marine Science 60:1-212. Available: Bulletin of Marine Science, 4600 Rickenbacker Causeway, Miami, Florida 33149. Hardcopy, non-subscribers: $35 post-paid surface; $55 post-paid air mail; Subscribers: $20 post-paid surface; $40 post-paid air mail. For more information on ordering back issues see the Bulletin of Marine Science website. Publication 3: Fuiman, Lee A., Ed. 1996. “Dynamic Morphology, Physiology and Behavour of Fish Larvae”. Marine and Freshwater Behaviour and Physiology 28 [Special Issue]:1-143. Available: International Publishers Distributor, PO Box 32160, Newark, NJ 07102. Hardcopy, $206 (shipping included). For more information on ordering back issues see the Journal of Marine and Freshwater Behaviour & Physiology website or Contents and Ordering. 20th Annual Larval Fish Conference. Coastal Fisheries Institute, Louisiana State University, and the Louisiana Sea Grant College Program, New Orleans, Louisiana. 13-19 June 1996, (Chaired by Richard F. Shaw). [Joint meeting with the American Society of Ichthyologists & Herpetologists, American Elasmobranch Society, Southeastern Fishes Council, Neotropical Ichthyological Association, and the Herpetologists League]. 21st Annual Larval Fish Conference. University of Washington, Seattle, Washington. 26 June-2 July, 1997. (Chaired by Art Kendall). [Joint meeting with the American Society of Ichthyologists & Herpetologists, Society for the Study of Amphibians & Reptiles, The Herpetologists League, and the American Elasmobranch Society]. 22nd Annual Larval Fish Conference. Zoological Museum, University of Michigan, Ann Arbor, Michigan. 9-13 July, 1998. (Chaired by Ed Rutherford). 23rd Annual Larval Fish Conference. N.O.A.A. Beaufort Laboratory, Beaufort, North Carolina, 6-11 April, 1999. (Chaired by Jon Hare). 24th Annual Larval Fish Conference. Dauphin Island Sea Lab, Gulf Shores, Alabama, 5-10 November 2000. (Chaired by Jim Cowan). 25th Annual Larval Fish Conference. NEFSC/NMFS/NOAA Howard Marine Sciences Laboratory, Sandy Hook, New Jersey, 8-13 August 2001. (Co-Chaired by Chris Chambers and Mike Fahay). 26th Annual Larval Fish Conference. Norwegian Institute of Marine Research, Bergen, Norway, 22-26 July 2002. (Chaired by Howard Browman). Publication 1: Browman, H.I. and A. Berit Skiftesvik, eds. 2003. The Big Fish Bang: Proceedings of the 26th Annual Larval Fish Conference. Institute of Marine Research, Bergen, Norway. Each article in the book can be downloaded as a pdf file from the book website. Publication 2: Govoni, J.J., ed. 2004. The Development of Form and Function in Fishes and the Question of Larval Adaptation. More information on the book and where you can order your own copy is available here. 27th Annual Larval Fish Conference. Santa Cruz, California, USA, 20-23 August 2003. (Chaired by Churchill Grimes). Publication: Feyrer, F., L. Brown, J. Orsi, and R. Brown, eds. Expected 2004. Early Life History of Fishes in the San Francisco Estuary and Watershed. 28th Annual Larval Fish Conference. Clemson, South Carolina, USA, 23-26 May 2004. (Chaired by Jeff Isely). 29th Annual Larval Fish Conference. Barcelona, Spain. 11-14 July 2005. (Chaired by María Pilar Olivar). Publication: Olivar, M.P. and J.J. Govoni (Eds.). Recent advances in the study of fish eggs and larvae. Scientia Marina 70S2 (Supplement 2): 1-174. (ISSN: 0214-8358). Articles are available online here . 30th Annual Larval Fish Conference. Lake Placid, New York, USA. 10-14 September 2006. [Joint meeting with the American Fisheries Society meeting] (Chaired by Jon Hare). 31st Annual Larval Fish Conference. St. John’s, Newfoundland, Canada. 9-12 July 2007. (Chaired by Pierre Pepin). 32nd Annual Larval Fish Conference. Kiel, Germany. 4-7 August 2008. (Chaired by Catriona Clemmesen). 33rd Annual Larval Fish Conference. Portland, Oregon. 22-27 July 2009. (Chaired by Douglas Markle). 34th Annual Larval Fish Conference. Santa Fe, New Mexico. 30 May – 3 June 2010. 35th Annual Larval Fish Conference. Wilmington, North Carolina. 22-26 May 2011. 36th Annual Larval Fish Conference. Osøyro (Bergen), Norway. 2-6 July 2012. 37th Annual Larval Fish Conference. Miami, Florida. 2-6 June 2013. 37th Annual Larval Fish Conference. Quebec City, Quebec, Canada. 17-21 August 2014. 38th Annual Larval Fish Conference. Vienna, Austria. 12-17 July 2015. 40th Annual Larval Fish Conference. Solomons, Maryland. 19-23 June 2016. 41st Annual Larval Fish Conference. Austin, Texas. 13-16 July 2017. Prepared by Dan Faber ([email protected]) and Darrel Snyder ([email protected]). Updated 22 October 2009 by Jeff Buckel. Last updated November 22 2017 by Klaus Huebert.